On a recent Saturday, a friend and I were wandering around a sleepy indoor market, perusing pet fish and party supplies as we tried to stay on mission: finding breakfast. We wanted something hearty, something delicious, something made with eggs. Guided by a sign painted on the wall, we made our way past maybe 40 stalls, hunting for Jose Chiquito. The popular food stand seemed like the perfect solution. Inside the Union Swapmeet, it was known for its fluffy pancakes and hearty breakfast burritos. As we passed an eyebrow threader, an acupuncturist, a cobbler and a couple of $2-and-over shops, we spotted a small, tidy to-go counter with a few two-person tables. Nearby, a refrigerated case displayed fermented drinks and food containers filled with colorful ingredients. They looked oddly familiar. Our confusion turned to joy as we realized we had stumbled on the unassuming reincarnation of Baroo, a funky, fermentation-focused restaurant that had won plenty of high-profile fans during its short, three-year tenure. Because this is Los Angeles and nothing good can last, the East Hollywood restaurant closed last October. At 11 a.m. on Saturday, Baroo's new incarnation, a mile-and-a-half east of its previous location, was opening up for the day. A row of to-go bags with Caviar receipts stapled to them sat on the counter while chef Kwang Uh organized in the kitchen and co-owner Mina Park handled front-of-house duties. They prepped the counter for service and styled their "toast of the day" to achieve the perfect Instagram post. Baroo's original home featured a large communal table that encouraged patrons to talk to each other. Although the new location is mainly for take-out, that spirit is still in effect. We sat next to a guy named Jesse who had, out of excitement, ordered more dishes than he could possibly eat. (Solidarity, brother. We are with you in your struggle to not over-order.) It was easy to strike up a conversation with him. After a few minutes, Jesse moved closer to us so he could share bites of his pastrami bowl, which featured morsels of the smoked meat mixed with fried rice, crisp shallots, kimchi and an egg. It was official. We were now friends. Park and Uh refer to their temporary home as Baroo Canteen. The ethos is the same but they've kept only two dishes from the original menu. Regulars will be pleased to see Karma Circulation, a bowl of fried chicken on a bed of kokuho rose rice with a wispy crown of tiny greens drizzled with a potent dressing of Korean chili paste and Kewpie mayo, and their Hong Kong-style prawn toast, served with kimchi, avocado and a tart citrus dressing. The new menu is inspired by the "family meals" the staff made during their shifts at the original location. Mina describes them as "fortifying but playful in spirit." 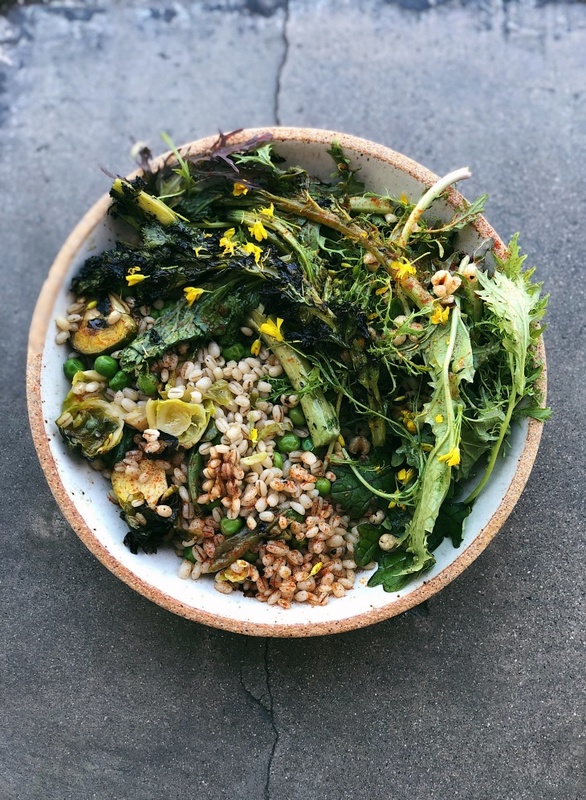 New menu items include a vegan barley bowl topped with tiny edible flowers and wasabina, which are Japanese baby mustard greens. 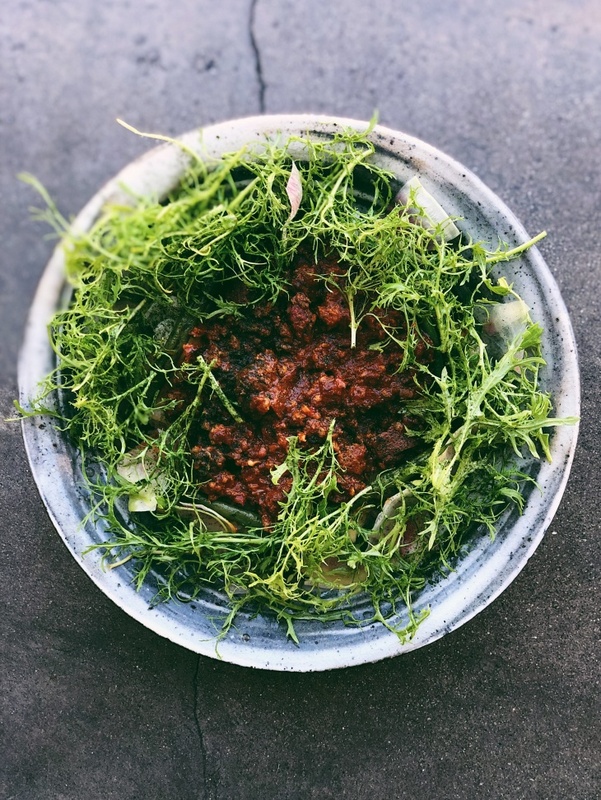 Another dish features minced pork and pancetta mixed with gochujang and the fiery red spices used in nduja, a spreadable Italian salumi. It's the best kind of cross-cultural mix. "The Baroo palate has a lot of different layers and features a lot of different combinations of flavors," Park says. She and Uh are always trying to hit the perfect balance of acid, salt, sweet and umami, especially through fermentation. "Fermentation is the backbone of Korean cuisine and it's ingrained in the flavors [we're] used to tasting but Korean people come to Baroo and are severely disappointed." That's because Park likes to serve food that can't be easily classified or pegged to a single culture. As an homage to Los Angeles, Baroo serves a delicious version of tepache, a fermented Mexican drink made from pineapple rinds. They're also playing with a Korean version of horchata using Job's tears, an under-the-radar grain often called Chinese pearl barley. Baroo opened in August 2015 with three partners but Park and Uh ultimately had a different vision than Matthew Kim, their third partner. He now runs BBQ + Rice, where you can order more traditional Korean bowls like bulgogi and galbi, in the old Baroo location. After closing Baroo in October 2018, Park and Uh wanted to open a new venture and they wanted to stay close to patrons of the original location. While looking for a more permanent home, they discovered Union Swapmeet, at the corner of Santa Monica Blvd. and Vermont Ave. Their real estate agent would sometimes grab a quick bite there while running between clients. "The vendors have been here for a really long time," Park says. "A hair salon, a tattoo artist, a man making keys, live birds. Latino and Korean immigrants, all warm and welcoming to us. It's a microcosm of L.A. that, sadly, is getting pushed out. It's a community of people who have come to America with really big dreams and have come to the swap meet to make something for themselves." According to its website, the Union Swapmeet was established in 1986 with a mission to "to help small businesses get their start, experiment, and thrive!" It is slated to be torn down in early 2020 and will be replaced by a seven story mixed use construction project. Park and Uh are conscious that they're part of the gentrification that's rippling through East Hollywood, raising rents and pushing out longtime businesses. That's part of why Park wants Baroo Canteen, for however long it's around, to be as accessible to as many people as possible. "How do we exist in this type of community in a responsible way?" she asks. 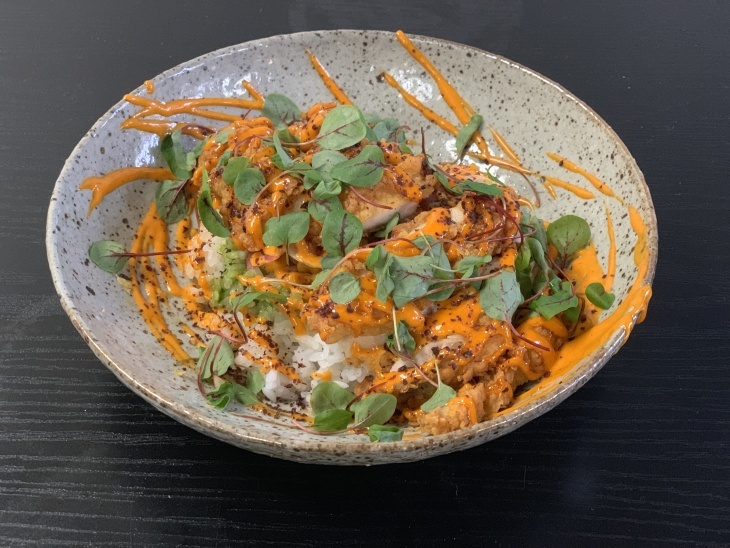 The most expensive dish at Baroo costs $15, whereas breakfast plates at Jose Chiquito maxed out at around $7 before it closed and Baroo took over its space. Park gives other swap meet vendors a significant break on the cost of their food. "It's fun to surprise people, and it's fun to be exposed to a whole different audience," she says. Her goal is to keep prices low but she knows Baroo's food is "still out of the price range of a lot of people, that's become clear being in the swap meet." Jose Chiquito "served delicious foods that people loved," Park says. "[We] have shoes to fill that [we] aren't meant to fill exactly but to be a part of the community here." Maybe the swap meet is the perfect metaphor for Baroo. A confusing blend of ingredients and cultures that somehow works together. Always changing. Always evolving. 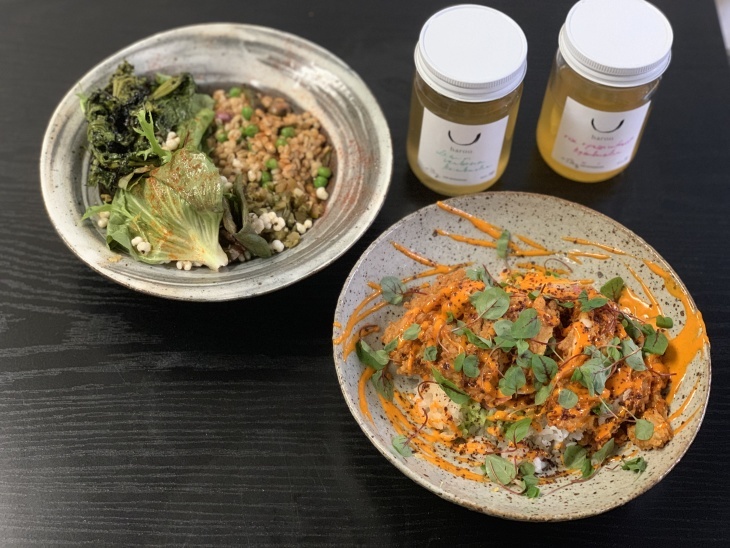 Baroo Canteen: 4632 Santa Monica Blvd., Wednesday - Sunday, 11 a.m. - 3 p.m.
You can order online via Caviar.